The owners designed the salon themselves (the space was a nail salon previously, so all of the plumbing was already in place, which made it a lot easier), but McCarter said that finding appropriate furniture was one of the biggest challenges. 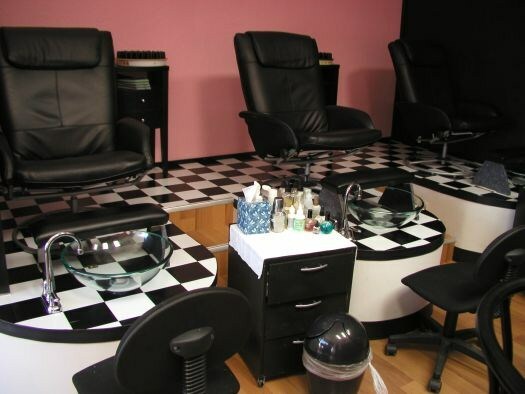 The salon had a few items custom built including a wooden platform to elevate the pedicure chairs above the bowls, the footrests, and the nail bar. The reception desk and bar stools were Craigslist purchases, Home Depot was the source for the faucets and pedicure bowls, and IKEA and Target were sources for several of the other furnishings. I thought this was interesting and something I’ve seen previously at other salons — furnishings that aren’t traditional salon furnishings, but instead bought from places like IKEA or cool, flea market finds. What’s been your experience with designing a salon? Were you able to find your furnishings (pedicure chairs, bowls, reception desks, etc.) through salon furnishing companies? Why or why not?